Update: Please see the comment section where a reader provides more evidence that the owner of the album was most likely Lois Viola Gilbert of Leeds, Maine. 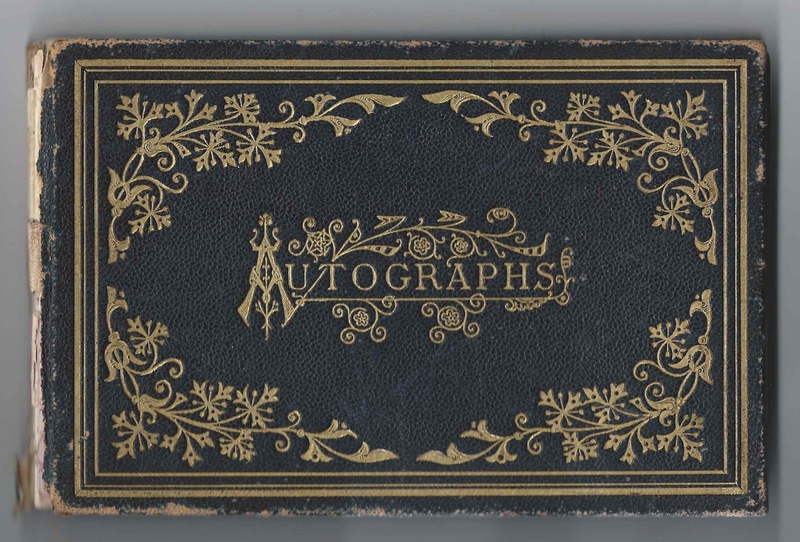 1870s autograph album that belonged to a Lois from Lewiston, Maine, or possibly Leeds, Maine, or Poland, Maine, which many of the signers indicated as their residences. 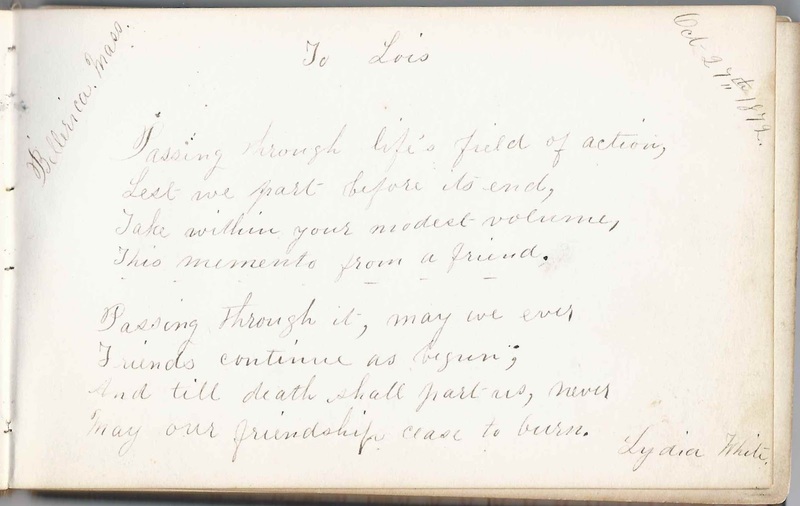 The album is approximately 6-1/2" x 4-1/4" and contains the sentiments of 44 of Lois' relatives and friends. An alphabetical list of the signers appears at the end of this post. Sadly, the album is lacking a title page and any page that might have provided Lois' surname. The first signed page in the album was that of Rosa at Lewiston, Maine, signed on September 12, 1872. Rosa indicated that she was Lois' sister. The only other page that indicated a family relationship with Lois was that signed at Lewiston, Maine, on June 8, 1873, by "Mother", who also did not give her surname, nor even her given name. Other than Lewiston, Leeds and Poland, signers came from New Gloucester; North Yarmouth; Empire [though I think that's in Poland]; and Auburn in Maine; and from Lowell, Billerica and East Boston in Massachusetts. 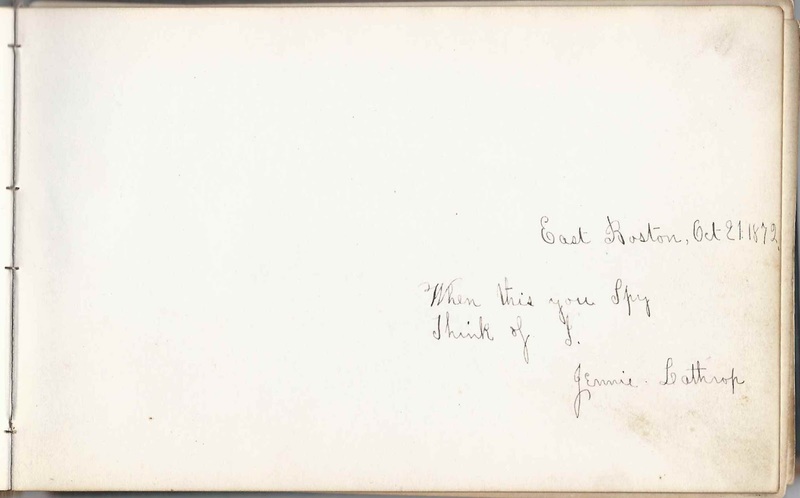 Jennie Lathrop signed a page at East Boston, Massachusetts, on October 21, 1872. 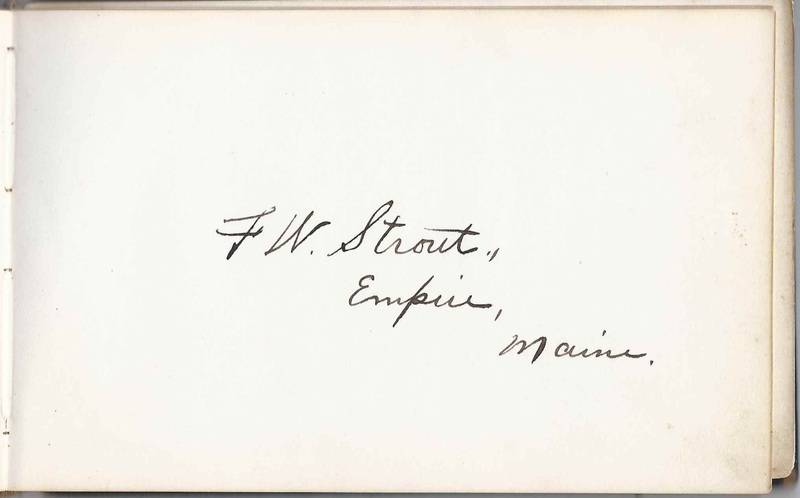 F. W. Strout signed a page at Empire, Maine; I believe this was the "Empire" located in or near Poland, Maine. Lydia White signed a page at Billerica, Massachusetts, on October 29, 1879. 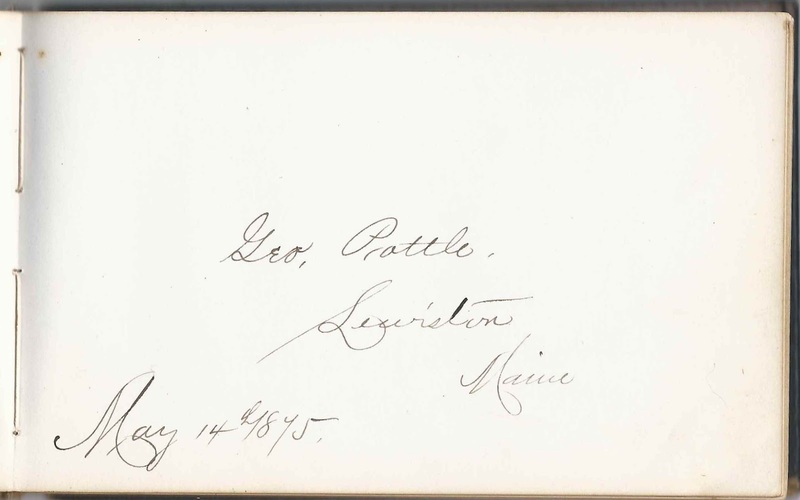 George Pottle of Lewiston, Maine, signed a page on May 14, 1875. 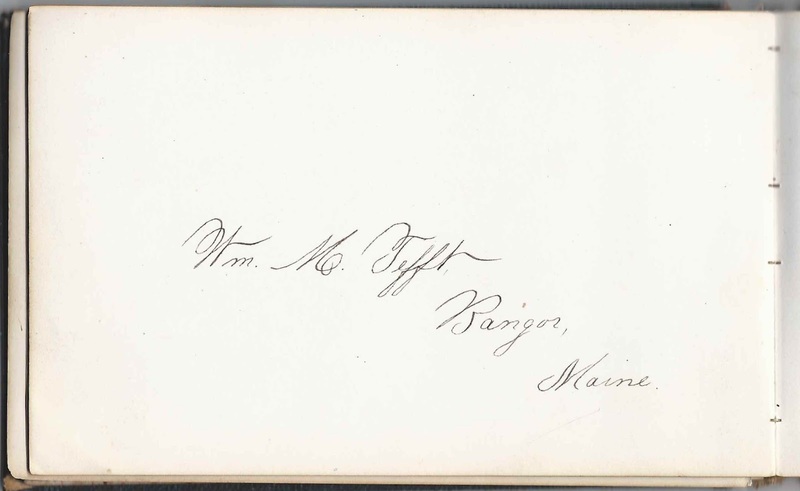 William M. Tefft of Bangor, Maine, signed a page. Rosa Tefft Pulsifer of Leeds, Maine, signed a page on December 12, 1876. Hannah Bowers or Hannah Rowe or ?, signed at Lowell, Massachusetts, on October 22, 1876; "aged 76"
Elvin D. Pulsifer of East Poland, Maine, signed on December 12, 1876. His wife Ellen (Locke) Pulsifer signed the overleaf. Mrs. E. D. Pulsifer of East Poland, Maine, signed on December 12, 1876. she was Ellen (Locke) Pulsifer, whose husband Elvin D. Pulsifer signed the overleaf. Addie May Pulsifer of East Poland, Maine, signed on December 12, 1876. 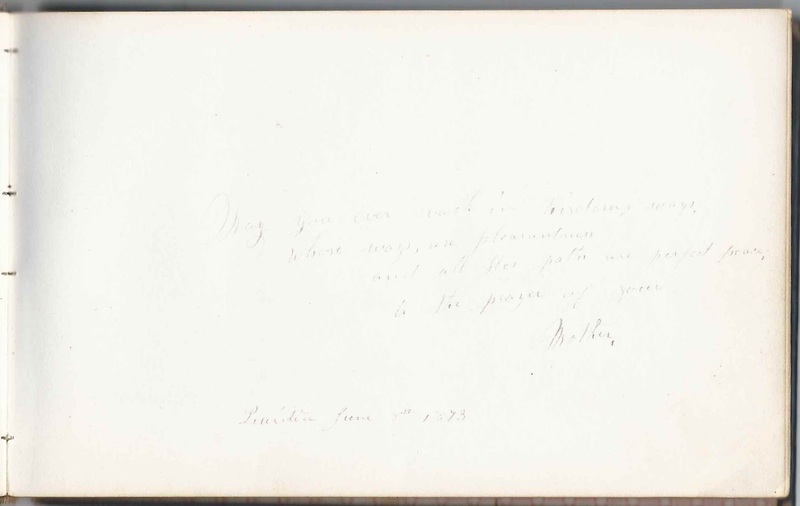 Her parents Elvin D. and Ellen (Locke) Pulsifer and sister Rosa Tefft Pulsifer signed preceding pages. Rosa Tefft Pulsifer, signed on December 12, 1876. Her parents Elvin D. and Ellen (Locke) Pulsifer and sister Addie May Pulsifer also signed pages. Josie F. Wagg, signed August 20, 1876. It was possibly her husband G. William Wagg who signed a subsequent page. G. William Wagg of Auburn, Maine, signed on August 20, 1876. 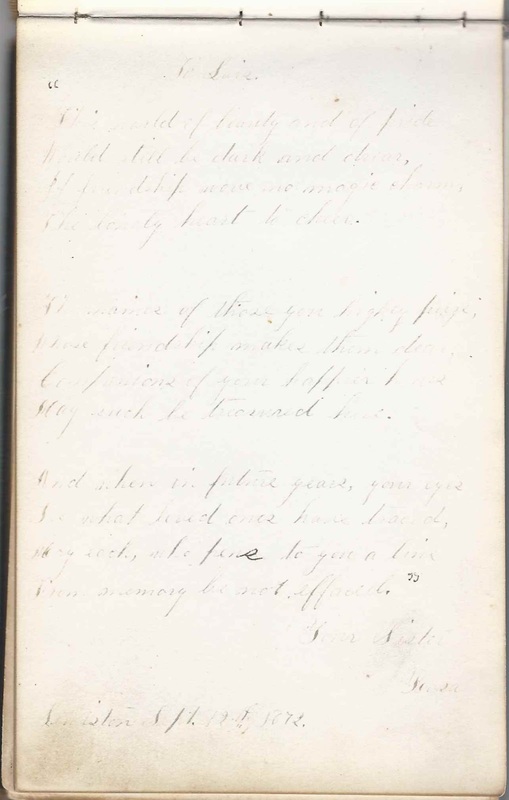 It was possibly his wife Josie F. Wagg who signed a previous page. M. Emma Wing of South Leeds, Maine, signed on April 20, 1884. She was Mary Emma (Hammond) Wing, whose husband Junius Carlos Wing signed the right facing page. J. C. Wing, signed at Leeds, Maine, on April 16, 1884. 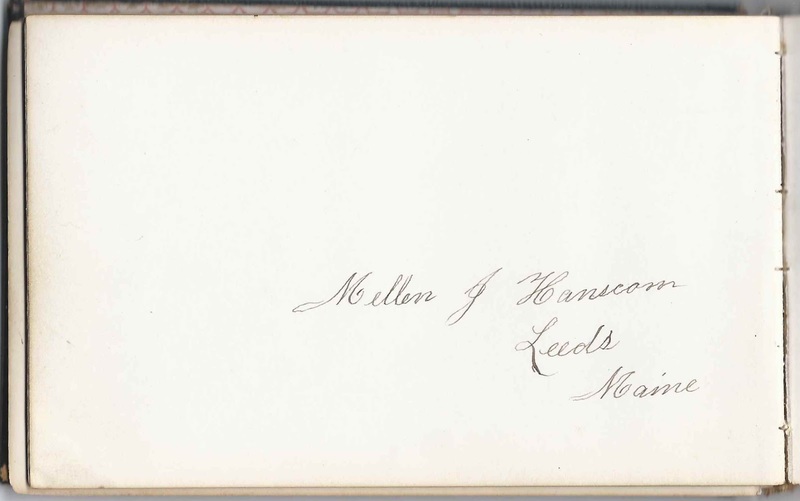 He was Junius Carlos Wing, whose wife Mary Emma (Hammond) Wing signed the left facing page. I think you have the right Lois. This tree at rootsweb says Lois V. Gilbert married Frederick Augustine Parker on May 10, 1879. Ancestry has a record of the marriage. Frederick had a sister named Abbie A Parker, who signed the album. Lois V Gilbert's mother was named Dianna Wing. This tree at ancestry.com shows that Lois' mother, Diana Turner Wing, was the sister of a Salmon Alden Wing. Salmon had a son named Junius Carlos Wing, who signed the album. So one of the signers is a sister in law to Lois Gilbert, and another is a first cousin.